This short lesson provides an overview of the world's oceans, including information about geography, physical properties, major currents, and the effects of oceans on weather and climate. Brief information about wind waves, swell, and tides and the drivers of each of these phenomena are included along with an introduction to ocean measurements. super cool information-I surf and this was a wonderful teacher-yes I also teach ocean physics so very well done folks!!! I think this lesson is interesting even some of the question seem tough to me but manage to finish it. This lesson helped me gain a better understanding of waves and the ocean. I found the lesson very interesting and I've learned new terms that are important to improve my knowledge. Great first look at the oceans and it's characters. It is good to know about the world's ocean for differentiating each of the oceans and its characteristics. Particularly interesting to one living in the Midwest rather than on the coasts. There seems to be new information (underwater sandbar) on Rip Currents compared to the lesson I took here a few years ago. I will review the earlier lesson. This is an area that I need to focus more on my study during the training. Your explanation of swells and wind waves is a bit vague and confusing. Otherwise great! Great intro. If you are new to these courses. take notes. Great course to learn the fundamentals of the oceans. 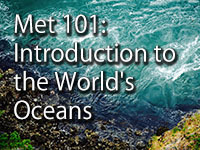 Met 101 is a great introduction to quite a few topics in "the World's Oceans". There is a lot of material but it is explained in a very easy-to-follow manner, with various graphs and quizzes along the way. Good introduction. I knew pretty much nothing about the subject before beginning and have sufficient information now to be more curious about the oceans. Very interesting topics arranged in a well-crafted chronology of the significance of the subject matter. I'm learning to be a sailor, and this was a great lesson. Thanks! Short but packed with information about the oceans. I liked this very much. Given the importance of the oceans and its currents to climate and weather, I feel this is necessary information. I teach a college level class on weather for non-majors. I will assign this to the class. Great lesson. Learned a lot about the world's oceans and their impacts. My overall experience with this class was excellent. I would recommend it to my friends who are interested in this topic. Well done. Wish it were a bit longer and a bit more detail. Fascinating! Very informative and I really found the graphics helpful. Best depiction and description of major current types I have seen yet. An intersting and educational lesson. Terrific, valuable knowledge. Learned a couple of eye-opening facts and loved it. Good for an introduction. Not a ton of detail, almost too basic in places, but otherwise some very good information. Also fairly well-structured, and did not seem to take as long as the other Met 101 modules. Very interesting and informative course. This is a great program to learn more about ocean mechanics. Good lesson but a little too light on the QUIZ - need more questions to cover the material effectively. If your line of work involves the marine/ocean environment and you don't have an educational background in that area, this is a great place to get started.